Crossing into China’s westernmost province, from Kyrgyzstan, was never going to be a simple affair. Due to ongoing ethnic tensions there, and recent surge in sporadic violence between government forces and the Uighur Muslim minority, regulations state that foreigners driving into the country with their own vehicle are most definitely, 100%, not allowed to travel alone. They must, at all times, be escorted by a local guide. To some, especially those gifted with a smidgen of common sense, this law is incredibly illogical. This is especially true when one considers that backpackers, hitch-hikers and bicycle riders are free to get about as they wish, unaccompanied. But never mind logic and common sense. We are, after all, talking about one of the most bureaucratically baffling countries on the planet! Just to give you a clearer idea of how difficult it has been to organize this country’s crossing, I’ll mention the fact that Chris and I started contacting fixers and agents even before we left Germany in September 2012. Technically speaking, this logistical puzzle-solving has been almost 2 years in the making. It was relatively easy to discover that there are very few foreign overlanders who attempt this feat. It was also abundantly easy to work out the cost of doing so: thousands upon thousands and thousands of dollars per vehicle. Apparently, according to the Chinese Government, the more one pays, the safer one is 😉 The mind-boggling price includes $1,600 worth of permits to cross the border and about $100 a day for a guide. This does not include your fuel, food and accommodation costs. Want to tour the country for 2 months? Hope you’ve got about $15,000 lying about! Yes, yes, I know what you’re thinking. Once we did this calculation…why did we not just forget about the whole thing? For two simple reasons really: first of all, other options of reaching South-East Asia were not really viable for us (they surely would have become so in desperation) but, more importantly, once we started to dig into the details of the laws in questions, we saw loop-holes everywhere. This was just the hook we needed to persevere. First of all, we discovered that as of February 2013, foreigners can fly into China, rent a nationally registered car from Hertz and get about unaccompanied. As part of the border-crossing requirements, our wheels will have Chinese number-plates, making them essentially nationally registered vehicles. There is no difference!! More digging revealed two other pivotal factors. Firstly, the law only dictates that guiding is required in Xinjiang and Tibet; it mentions NOTHING about it being necessary in every other province we needed to cross to reach Laos. Unlike what 99% of agents were telling us, if we needed a guide, we would only need it for the first week, not the entire time. Secondly, something which we only discovered much later, there is nothing in any law which specifies that the guide must be registered, only that he (or she) must be a Chinese national. Before too long, crossing China by exploiting the government’s dubious laws, and spending as little as possible in the process, became our most fervent desire. If we were going to do nothing else on this journey…we were going to pull this off. We just needed a like-minded ally in the country; not only one who understood our reasoning, but also one who would be more than willing to fight ‘the system’. This is what took us over a year and a half (and hundreds of sent emails) to find. This is the friend in China we needed…one with an abundance of even more friends all over Xinjiang. Today, on day 7 of our crossing of Xinjiang, I can confidently say that it is the single most unforgettable travel experience I have probably ever had. Ever. For almost a week, we have been safely and lovingly handed over from friend to friend along a stretch of almost 2,000kms along Xinjiang’s Taklan Desert. Each person only knowing the one before him and only vouching for the one who will come after him. They have escorted us through the insane city traffic, found us hotels (some even insisting on paying for it! ), they have taken us into their homes to meet their families and out to sumptuous restaurants feasts to meet with their friends. They meet us at designated posts along the highway with bags full of drinks and food. They come in their 4Wds, cars, motorbikes and scooters. Each person driving only a total of 50, 100 or 200kms…never accepting money for their petrol use or time, never allowing us to pay for a meal. What started as a mission to take on a logistical challenge, and save some cash at the same time, has turned into an exceptionally priceless experience. There’s no money in the world that could ever warrant this extent of kindness and altruism. While we’re looking forward to some slower riding days, and time alone, we are also quite melancholic. We have found it nearly impossible to show our gratitude to the incredible people who have, so far, taken such good care of us. 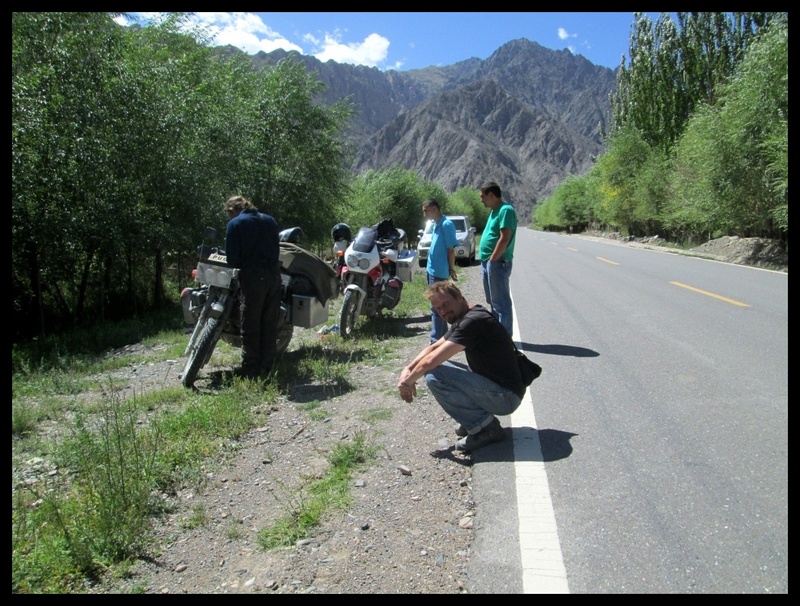 Our most heartfelt thanks, of course, go to a special motorbiker guide who has been organizing tours from Europe to China for over 20 years. He is the one who has made all this possible, the one with the vision and the desire to help us out. We will never forget what you have (and still are) doing for us. For quite obvious reasons I shall refrain from mentioning your name or tour company, lest I get you into any sort of trouble. You know who you are….so thank YOU. I’ll leave you now with just a few glimpses of our insanely fun first week in China. This entry was posted in Overlanding and tagged adventure, adventure travel, appreciation, BMW F650, China, curiosity, discovery, explore, long-term travel, motorbike trip, overlanding, Travel, world trip, Xinjiang. Bookmark the permalink. Good to read that you are having a great time. What can I say: I’m jealous and simultaneously I’m incredibly happy for you and proud of you pulling this off. I’d like to thank you for all the work you did which most likely will help us all to follow in your footsteps. When we left our car in Pakistan for a backpack trip in Xinjiang (2004) and again in Laos to backpack into Yunnan (2005), we returned with one vivid image: to one day drive around China independently. I can’t wait to go there! So Karin, if you’d be kind enough to give me a day or two? I am in the process of compiling a long list of Q&A about our China crossing which I shall post on my blog, for the sake of time management. (You are right, I found 22 emails in my inbox this morning!) Although I am quite sure I will not answer ALL the questions everyone has, perhaps we’ll wait and see and then email? Hope that sounds good to you. Yes, of course it makes total sense to simply elaborate on all the issues in a blog post, maybe a FAQ set-up? I’ll just wait for that and if I have more questions, I’ll let you know. We’d love to meet you on the road one day. Where are you now and where are you heading? We have been in Laos now for exactly one week and are loving it to bits. We are both totally exhausted from our 2-month trip in China so all we want to do for a few weeks is rest, eat, rest, eat, rest…well you get the point. Now it’s my turn to be jealous…you have a pressure cooker??!! OH MAN that’s wonderful! Thanks for sharing the story around ( I just found you on FB) our ‘payment’ for all this will be the satisfaction of knowing we can help fellow travellers break though the Great Bureaucratic Wall of China. ha! Pls tell Coen I also got his email just now, and will let you guys know when new post is up. 2.) From south to south (Vietnam-Lanzhou-Lhasa-Nepal). It is written down 2005 in the HUBB. Hey Norbert, that is great news to hear! I do wonder why no-one else managed to do it officially, though, after you did? Did you manage to get official province permits to drive through unguided? mind you, as we all know, the laws in China have changed immensely in the last decade, due to (primarily) the ethnic tensions in Xinjiang. Please tell me about your experience in China. I don’t wanna ride as much as you did, I just wanna go from Tianjin to Erenhot, since I’m gonna be coming to China from South Korea and once there to Mongolia. How did you do and what should I worry with? As for your answer, you’ll need to read the following two posts to get an idea about crossing China on your own. I have NO information about your route, only the ones we undertook from Kyrgyz to Laos!